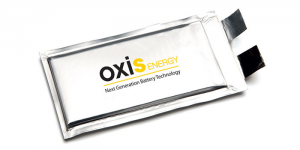 The lithium-sulfur battery specialist Oxis Energy announced a number of new investors. These include the technology group Safran, with which Oxis has also signed an agreement to develop battery systems for commercial aircraft. Other investors for the battery specialist include Aerotec Brazil, which is now Oxis’ second largest shareholder after Sasol South Africa, and the chemical company Arkema. In total, the British company managed to generate nearly £24 million (approximately €27.5 million) so far, which will be used to commercialize and automate a process for the mass production of rechargeable lithium sulfur-cells and modules. Let us remember: Oxis Energy is a key player in the European project LISA (Lithium Sulfur for Safe Road Electrification), which started on January 1, 2019, and is also leading the Innovate UK-funded Lithium Sulfur Future Automotive Battery (LiSFAB) project to commercialize sulfur lithium technology for large electric vehicles. The company itself has focused primarily on the aviation sector and now holds a good 140 patents, more than 100 of which have been filed. According to their own information, the British company has adapted the energy density of their own lithium-sulfur battery cells for use in electric aircraft to 425 Wh/kg. By the end of 2019, the manufacturer wants to increase this value to 500 Wh/kg with the help of partners. The company has already developed a battery module concept for the aviation sector which, according to Oxis, will “triple the flight time”. It is based on lithium-sulfur pouch cells with an energy density of 300 Wh/kg. A few months ago, Oxis announced the intention to open a production facility in the state of Minas Gerais in southeastern Brazil. For this, the British were promised extensive financing in the amount of 3.7 million British pounds by the above-mentioned investor Aerotec. The production plant in Brazil will sooner or later be able to produce millions of cells annually.